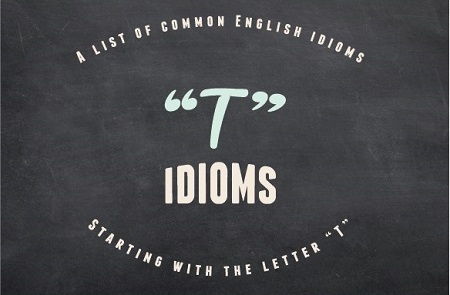 Here’s a handy "T idioms" list! You probably think it “TAKES forever” to learn idioms, right? Well, although it “TAKES some doing” you’ll be surprised how quickly idioms can “TAKE hold” in your mind. Here's a good tip that I recommend to all of my beginner and intermediate students: At first, just focus on understanding idioms and noticing them when other people use them. It's possible to speak English at a very high level without using a lot of idioms in your own speech. That's because there are many different ways of saying the same things. After you have a very good understanding of some idioms, you can sprinkle them into your own speech and writing. Although you don't need to use them frequently, you absolutely have to understand idioms to reach an advanced English level because native speakers use them regularly. You'll notice this list has expressions beginning with the letter "T." That is, the main word in the idiom starts with a "T". There are also pages of idiomatic expressions with other letters of the alphabet: click here to go to the main idioms page. After dieting for three months I was really excited that my jeans fit to a T again. That’s a beautiful dress and it fits you to a T.
pick up the tab (for something): to pay for something. I can’t believe my date asked me to dinner but forgot his wallet so I had to pick up the tab. My boss was so generous for picking up the tab for everyone at happy hour last night. bring something to the table: to add something of value. Please don’t invite the marketing director to this meeting — she’s so negative and never brings anything to the table. The discussion was so useful and every participant brought something to the table. on the table: something that’s being considered. There are three agenda items on the table for tomorrow’s discussion — does anyone need to add anything else? We’ll leave the offer on the table until the end of the week so you can carefully consider it. set the table: to put dishes, flatware, glasses, etc. on the table before a meal. clear the table: to remove dirty dishes, flatware, glasses, etc. from the table after a meal. My daughter sets the table and my son clears the table after dinner as part of their chores. Could you please set the table while I finish preparing dinner? When I cleared the table I discovered my five-year-old had put all of her vegetables inside a napkin. under the table: something done secretly (and often illegally). If you want to get a window seat at that restaurant you need to give the hostess $50 under the table. The mayor was recently convicted of awarding construction contracts under the table. turn the tables (on someone / something): to change a situation to its exact opposite. Our opponents turned the tables on us and started playing aggressive defense in the second half of the game. I sure hope my son will turn the tables and become serious about his studies. wait (on) tables: to serve customers meals as a waiter / waitress in a restaurant. I waited tables for five years to pay expenses while I was in college. If you work at a fancy, upscale restaurant you can make great tips waiting tables but it’s really hard work. keep tabs on someone / something: to monitor or carefully watch someone or something. Since my parents are keeping tabs on me I got a second phone that they don’t know about. This app is excellent for keeping tabs on how many calories you consume each day. tack on something (tack something on): to add something extra onto something. Check your bill carefully because we noticed our phone company tacked on some extra services we didn’t order. The report looks great but why did you tack on the statistics here? They need to go in the results section. tag along (with someone / something): to go somewhere with someone without being invited. My five-year-old always wants to tag along with his older sister and today, when she refused, he was heartbroken. tail off: to gradually lessen. Could you please repeat your question — your voice tailed off at the end and I couldn’t hear you. The fastest runners sprinted ahead of the pack and the slowest runners tailed off at the halfway mark. one’s tail between one’s legs: to be ashamed or embarrassed about something (like a dog that’s been scolded). When my supervisor yelled at me for being late, my colleague explained that I had taken my father to chemotherapy — then my boss walked away with his tail between his legs. I sat at the meeting with my tail between my legs because I was the only person who hadn’t completed their part of the project. tailor-made for someone / something: to be specially made to fit or suit someone or something. All of our private English courses are tailor-made to the individual student to help them reach their personal goals. Each desk and chair is tailor-made for our employees to ensure an ergonomic workstation. go into a tailspin: to worsen very quickly. After I lost my scholarship everything went into a tailspin: I couldn’t afford to pay my tuition so I had to get a job which left me with no time to study and my grades plummeted, and so on. When I got diagnosed with cancer my professional life went into a tailspin but my personal life greatly improved as family and friends rallied around me. hard to take: difficult to manage, experience or believe. At first the news that I’d lost my job was very hard to take but after a week I was actually happy about it. Finding out my son enlisted in the military has been very hard to take and I pray nothing will happen to him. not take kindly to something: to not be pleased with something. I did not take kindly to my manager’s suggestion that I wear more makeup and jewelry. My dog did not take kindly to the new diet dog food the vet recommended. take after someone: to resemble, look like or have the same qualities as a relative. My son takes after his grandfather with his musical talent. It’s strange but I don’t really take after anyone in my family — everyone is short and has dark hair while I’m tall with blonde hair and green eyes. take away (from something): to reduce something. I think all the make-up you wear really takes away from your natural beauty and makes you look cheap. If you take away some of the background from the introduction I think your paper will be more effective. take charge (of something): to get control over something. I wish someone would take charge of ordering supplies for the company because we’re always out of something when we need it. When the new manager took charge of the department everyone was forced to be on time in the morning. take effect: to begin working. It will take six months for the new tax increases to take affect so we hope to move the company to a new state before then. Take two pills an hour before you go to sleep so they’ll take effect by the time you get in bed. take forever: to happen slowly or require a long time to do something. Let’s go somewhere else — it takes forever to get served at this restaurant on Friday nights. I thought it would take forever to get my driver’s license renewed but the whole process only took 20 minutes. take hold: to become established. It didn’t take long for a more professional atmosphere to take hold after they instituted a dress code and tracked working hours. I really hope smoking bans in public places will take hold in the poorer countries in the years ahead. take it easy: 1) to rest and relax; 2) to not become angry, agitated or upset about something. I took it easy this weekend and caught up on sleep. Take it easy — I know it’s not the best place but I already found us a new hotel to stay tomorrow night. take it or leave it: 1) either accept or refuse something without changes or discussion; 2) to have a neutral feeling about something. That’s my final price — take it or leave it. When I asked the landlord to paint the apartment she said it’s for rent as is and we can take it or leave it. My wife really wants to live in the suburbs but I could take it or leave it. take off: 1) to leave the ground and fly; 2) to leave or depart quickly; 3) to become successful very quickly. You just missed it — the aircraft took off two minutes ago. I’m always anxious watching the space shuttle take off after that explosion years ago. Sorry to take off so soon but my wife’s waiting at home for me. I cannot believe your friend took off without even thanking us for dinner! Sales took off after my jewelry was featured in a national magazine. It seems like sudden success to everyone but I wrote for years before my blog took off. take (something) off: to not work for a period of time. This week has been hell because my boss and the receptionist took the week off and I was left to do everything. I decided to take the day off and run some errands. Could I take next Friday off? I need to see the dentist. take off after someone: to chase or follow someone who just left a place. I took off after the woman who was in front of me at the grocery store because she forgot to take her credit card with her. My three-year-old takes off after me anytime I leave one room and go to another. take on someone (take someone on): 1) to fight or compete against someone; 2) to hire someone for a job. Roger Federer is taking on Novak Djokovic in the next round of the French Open tennis tournament. The heavyweight champion said he will take on any challenger who wants to fight him. We took on two new teachers so we could offer Japanese and Chinese classes. We couldn’t afford to take on another administrative assistant but sometimes we use temporary employees when we’re very busy. take on something (take something on): 1) to accept something; 2) to fight against something. Our grandma took on all the responsibilities at our house when my mom returned to work. I’m sorry but I can’t take on any more clients at this time. We’re ready to take on these corporations if they don’t agree to use environmentally-friendly products. take some doing: to require a good amount of work and effort. It will take some doing but this house will be worth a lot of money after the renovation. Learning a new language takes some doing but anyone can do it. take someone aside: to bring someone to a different area to privately speak with them. I tried all evening to take the artist aside but everyone was also trying to talk to her. I was so happy when the team leader took me aside and said my project was outstanding. take someone back (take back someone): to resume a relationship with someone. If your spouse hits you, don’t ever take him or her back without going through professional counseling together. I took my girlfriend back two times but now I realize she’ll never change and we’re not good together. take someone back to something: to make someone remember something. This song takes me right back to senior year in high school. Seeing this little book again takes me back to when you were a baby. take someone down (take down someone): to remove someone from a position of power or control. Whenever we take down a dictator either another one appears afterwards or there’s chaos. The board of directors is trying to take down the CEO of the company. take someone out somewhere: to bring someone to a place for food or entertainment. My son always takes us out for a nice meal on our anniversary. My fiancé took me out for pizza and bowling on our first date. take someone up on something: to accept someone’s offer or invitation. I hope you’ll take me up on going out to have coffee one day. I just might take you up on your offer to babysit next weekend. take something as it comes: to deal with something when it happens. Try not to worry about possible problems—we’ll take any challenge as it comes. I know this sounds basic but I just took each chapter as it came and I slowly finished writing the book. take something away from someone / something: to reduce the positive quality of someone or their work. No one can take away your dignity if you don’t let them. Even though you didn’t get selected, no one can take the experience away from you. take something back (take back something): to admit what you said was wrong. I take back my earlier comments — you’re right, there were more jobs created under this administration. If you don’t take back what you said about my friend I’m leaving right now. take something / someone for granted: to fail to appreciate someone or something; to expect something will happen automatically. After I became sick, I never took my health for granted ever again. Don’t take your most loyal fans for granted or your singing career will not last very long. take something out on someone: to express frustration, anger, etc. at someone who didn’t cause these negative feelings. Every time my husband has a hard day at work he comes home and takes it out on me. I’m tired of you taking your frustration out on me — why don’t you go to the gym and work out your stress before you come home? take something over / take over (something): to get control over something or be responsible for something. The two companies merged after a hostile company take over. Starting in March, my mother will take over babysitting our youngest child in the afternoon. Can you take over the phones today for an hour while I go to lunch? take something upon oneself to do something: to voluntarily decide to accept responsibility for doing something without being asked to do it. Why do you always take it upon yourself to volunteer for projects at the church? I was thrilled when my daughter took it upon herself to help me by cooking dinner twice a week. take to someone: to start to like someone. My dog takes to anyone who scratches her ears. Luckily, my father-in-law took to me the first time we met. take to something: to start to enjoy doing something. I never dreamed I’d take to skydiving but I love it. My cat has taken to sleeping on the window sill in the mornings. take up where someone left something off: to continue doing something that someone else started. It was difficult to take up the project where my predecessor left off because she didn’t leave any notes. Julie, please take up reading where Jonathan left off. taken aback: to be surprised or confused about something. I was taken aback when your mother asked if I’m having trouble getting pregnant. We were all taken aback when my friend’s wife told us to all go home before dessert was served. (have got) what it takes: to have everything that’s needed or required. If you knew what it really takes to be a model you wouldn’t want to do the work. He had everything it takes to make it as a champion except 100% self-confidence. something takes the cake: an extreme example of something. for the taking: easily available. I just went to the kitchen and there are free chocolates for the taking. If you’re looking for work for the summer there are a lot of jobs for the taking at the new outlet mall. talk back: to rudely reply. If my children ever talked back to me like that they’d be grounded for weeks. My son got detention for talking back to his teacher again. talk down to someone: to speak to someone as if they are not intelligent or inferior. Don’t talk down to them just because they’re high school students or they’ll hate your speech. My doctor talked down to me at the first appointment but was respectful when my father came with me to my second visit. talk someone into something: to persuade someone to do something. I wish I had gone with Sandy to buy her car — the salesperson talked her into purchasing the most expensive model. Please stop asking — you’re not going to talk me into letting you go out with your friends tonight. talk someone out of something: to persuade someone not to do something. Hello, I’m at the shopping mall looking at the cutest $500 purse and I need you to talk me out of buying it. I think we managed to talk her out of accepting that job but let’s hope she doesn’t change her mind. talk someone through something: to explain something in detail or explain how to do something step-by-step. Could you please talk me through your CV since you graduated from college? Their customer service is excellent — they talked to me through the entire installation. talk out of both sides of one’s mouth: to say different things about the same topic to different people. If that’s what he really said then he’s talking out of both sides of his mouth. I thought Sheila was my friend but I discovered she was talking out of both sides of her mouth. take notice (of someone / something): to give attention to something. A year ago I started to take notice of what the successful salespeople were doing and now I’m one of the top sellers for my company. Now that my daughter has started to wear makeup and style her hair, the boys have definitely begun to take notice. talk some sense into someone: to try to help someone to see a situation more realistically. Please try to talk some sense into him — he wants to quit college with only one semester left. I’m glad my parents talked some sense into me when I was thinking of spending my savings on a Porsche Carrera. talk shop: to talk about work when you’re not at work. I hate going out to dinner with my husband and his colleagues because they always talk shop. It’s happy hour! We’re supposed to be happy so stop talking shop. (off) on a tangent: to suddenly do or talk about something completely different. I hate her lectures because she continually goes off on tangents which are boring and distracting. I’m sorry to interrupt but you’re going on a tangent and I’d like to finish the agenda items before we adjourn the meeting. tangled up with / in something: to be involved with something that is hard to get out of. I got tangled up with a bad group of kids when I was in high school and finally I had to switch schools because they wouldn't leave me alone. Don’t get tangled up in any new projects this semester because you’ve got your college entrance exams to take. throw a (temper) tantrum: to become angry, upset and argumentative. My husband throws a temper tantrum every time I ask him to carpool the kids to soccer practice. Seriously, if you keep throwing temper tantrums for little things like that you won’t have a boyfriend to complain about. taper off: to gradually lessen. As you start to recover, we’ll taper off the pain medication. Lots of people always join the gym in January but the number of new enrollments tapers off in mid-February. (right) on target: accurate, correct, according to plan. Our sales figures are on target for a 40% increase in yearly profits. You could tell his speech was right on target by the number of tweets, Facebook likes and positive comments on our blog. with a bad taste in one’s mouth: having an unpleasant memory of something. It left a bad taste in my mouth when my friend complained for an hour about her dog but didn’t ask how my sick mother was feeling. Every time I see my aunt spank my cousins it leaves a bad taste in my mouth. third time's the charm / third time lucky: the third time you try to do something you succeed. I applied for a job with the United Nations three years in a row and finally got offered a job. As they say third time's the charm! Most people give up the first time they fail. Too bad they forget the third time's the charm. Even though I've already failed the exam twice before I continue to remind myself that I'll be third time lucky. tie the knot: to marry. Congratulations on your engagement! When are you tying the knot? We tied the knot in front of our immediate family and a small group of friends on the beach in the Barbados. 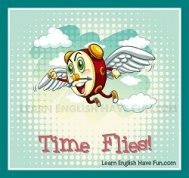 time flies (time flies when you're having fun): time goes by very quickly. You're 25 years old! It seems like yesterday you were learning to drive. My does time fly! There are still five weeks before Christmas but I know time flies so I should really start shopping for gifts this weekend. Whenever I go on holiday I notice how time flies when you're having fun. race against time: a situation where someone has to finish something quickly, in a short or limited amount of time. a ton of (tons of): a lot of something; a very large amount of something. I got a ton of mosquito bites when we went hiking yesterday. All I care about is getting tons of sleep this weekend! I'm exhausted. My kitchen has a ton of ants so I'm calling the exterminator. cat / cat's got someone's tongue: an expression that is used when someone is quiet and isn't talking or responding when you expect them to. My five-year-old talks all the time—except when we see my friends or coworkers. Then the cat's got her tongue and she can't even say hello. I feel like the cat's got my tongue every time the director calls on me at meetings and sometimes I can only shrug my shoulders like I have nothing to say. Answer me! What's the matter? 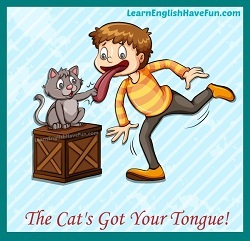 Cat got your tongue? (leave) a paper trail: (to leave) a series of written documents that show what someone did or how something happened. My kids left a paper trail of empty candy wrappers so I knew they'd been into their Halloween candy. Luckily, my attorney told me several months ago to leave a paper trail just in case they tried to fire me so I've got everything on record. Let's check your understanding of these idioms by using them in a few practice sentences.